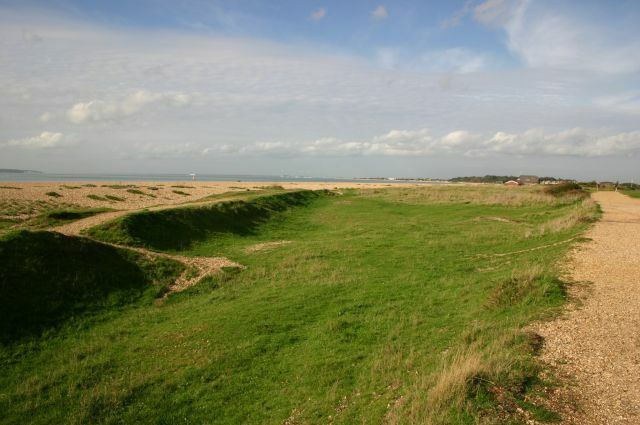 In 1918 there were two separate military railways on the Stokes Bay/Haslar peninsula. The first was the line from Monckton Hutments (some sources say from Haslar Barracks) to the School of Electric Lighting at Stokes Bay. The second was the line from Fort Blockhouse, running along the sea wall to Haslar Barracks. Both were constructed by the Royal Engineers. Baker Brown, writing in The History of Submarine Mining in the British Army 1910 (published 1923) states that the two were formerly connected. He wrote of the Stokes Bay Submarine Mining Establishment (this became the School of Electric Lighting in 1904) "the parade was covered with 18" tramlines which were connected with Forts Monckton and Blockhouse by an 18" railway on which ran a couple of small locomotives". 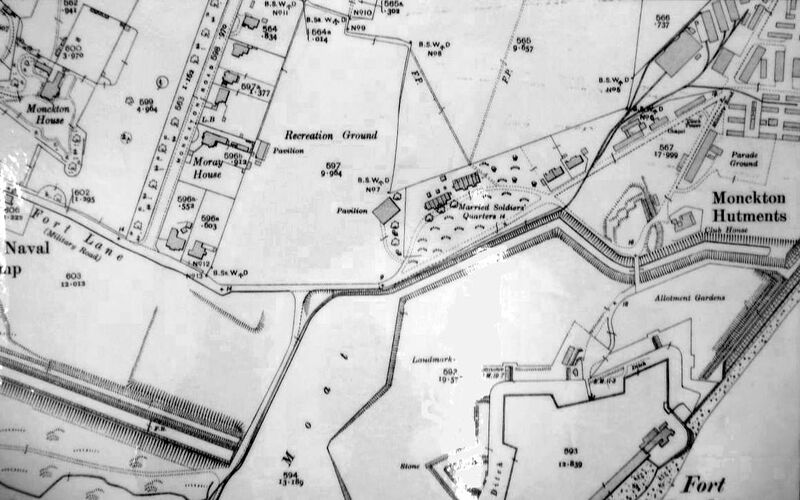 The internal tramlines at both Blockhouse and the Stokes Bay Submarine Mining Establishment are shown on plans as 18inch gauge, standard for submarine mining establishments. A plan of Fort Monckton dated 1892 shows an 18inch gauge 'tramway' running from inside Fort Monckton with two external branches, one running for a short way along the outside of the ditch of the fort that connects it with the Gilkicker Lake. The other branch ran from Fort Monckton around the outside of the ditch towards Halsar sea wall. This end of the tramway ran along the Haslar sea wall past Haslar Barracks to Fort Blockhouse. It is shown on maps and plans of Haslar Sea Wall and the Haslar searchlights installation (dated 1898-1900) as being 18" gauge. One plan (dated 1912? Admiralty Department of Works plan kindly supplied by C.Donnithorne) shows a tramway running from the S.E.L. at Stokes Bay to Fort Blockhouse and this is probably the 18inch tramway referred to by Baker Brown. 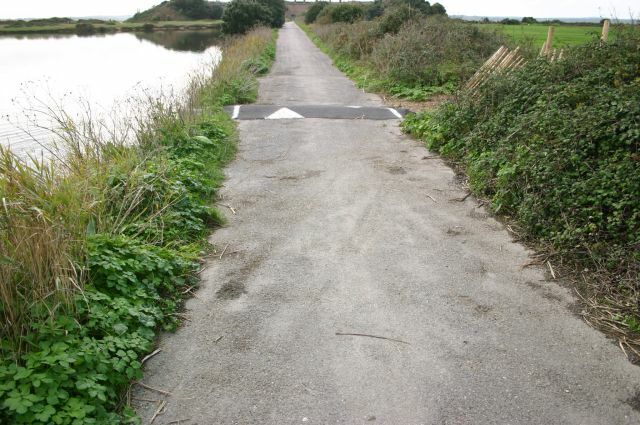 The later railway (post 1918) running from Monckton Hutments to the Stokes Bay School of Electric Lighting is of 60cm (2ft) gauge suggesting that it replaced the narrower gauge tramway after the establishment became the School of Electric Lighting. 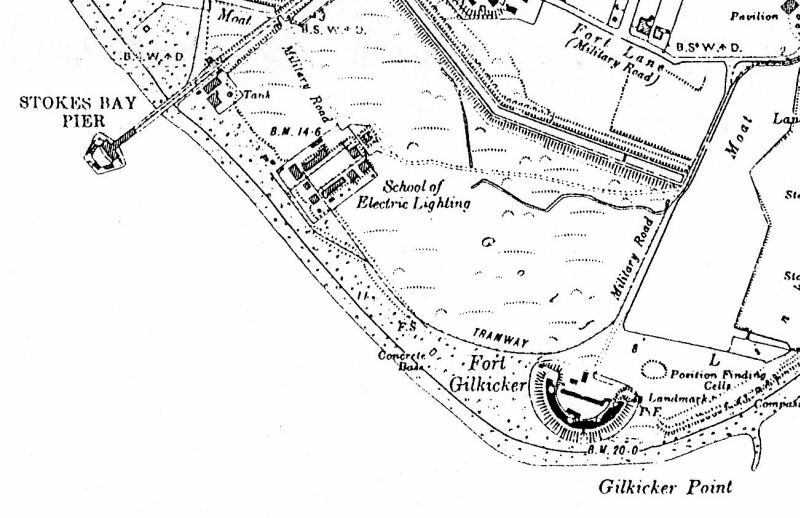 The Stokes Bay Military Railway running from Monckton hutments and Haslar Barracks to the School of Electric Lighting. The Halsar Express. The engine is Simplex Motor Rail 1234 built in 1919 here seen as LR2955. The R.E. had a few short lines of narrow gauge railway at Chatham, Gosport and elsewhere, and instruction in the use of such lines was included in the courses for officers and men in the Fortification School at the Submarine Mining Establishment. The post 1918 Stokes Bay Military railway line was a 60cm narrow gauge line which ran westwards from Monckton Hutments, north of Fort Monckton, along the line of the northern ditch of Fort Monckton past the married quarters in Fort Road. From there it turned southwards down the Military Road road towards Fort Gilkicker. Where the Gilkicker Lake ended the railway turned westwards then north westwards on to the Submarine Mining Establishment east of Stokes Bay pier. Here it branched into two lines running on an earth embankment. A letter in 'The Evening News' from a soldier who served in the School of Electric Lighting in 1931-32 (George Pope) stated that the line ran from Haslar Barracks through Monckton Hutments on a line parallel to Fort Road. It was maintained by sappers from L.(F) Coy. R.E. at Haslar Barracks and in 1931 had one engine and six top trucks. "In the area of the Hutments were various branch lines so that the trucks could be moved between the various departments, but the main line was a single track, and there were again branch lines at the pier end. It did not go into Fort Monckton". 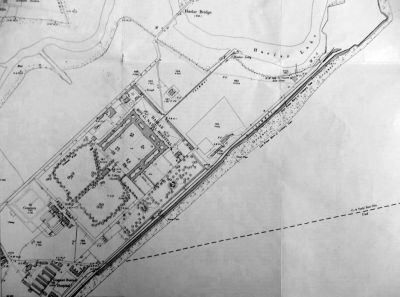 Plans show that the northern end of the line inside Monckton Hutments did not actually run as far as Haslar Barracks but was south of it. George says that the line was used one each week to carry stones etc. 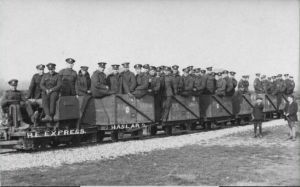 The Military engines that ran along the line from 1918 to 1934 were Simplex Tractors Motor Rail 1173 (LR2894) a Hunslet engine and two 4-6-OT HE 1354 (LR3238) and HE 1355 (LR3239-R.E. and 4530-Army). All were for 2ft gauge tracks. Another source (The Hidden Railways of Portsmouth and Gosport by Dave Marden) says that Motor Rail 1234 (LR2955) was also used on the line. "this example found its way to the Royal Engineer's Haslar Depot for use on the Stokes Bay Light Railway in 1919". A photo of this is labelled by the photographer as 'R.E. Express Haslar 2' and shows the engine with six open topped trucks as in the description by George pope above. In 'Blitz' by David Maber it is reported that in 1941 a John Davis was sent to Fort Monckton to man the searchlights. 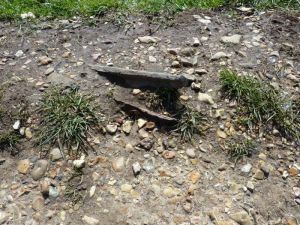 He "recalled the narrow gauge railway that ran towards Stokes Bay pier, the soldiers would often mess about on the platformed carriages that were on the lines." Sometime after 1941 the system was closed and the line dismantled but sections of the line could still be seen up to the 1990s and the route of the railway can still be traced. At least one of the engines HE 1355 was moved to Marchwood for training purposes where it became 4530. Another was advertised for sale in 1921 when it was lying in R.E. stores at Monckton Hutments. It was bought back by Hunslet, who refurbished it and sold it to Nepal. The Submarine Mining Establishment buildings at Stokes Bay after they became the School of Electric Lighting (Searchlights) showing the railway (tramway). 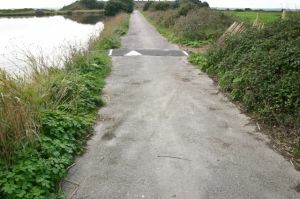 Imprint of the railway lines in the tarmac of the approach road to Fort Gilkicker. For many years a small length of the railway could be seen in the grass to the left and right of this point. The railway embankment running from the Submarine mining Establishment toward Fort Gilkicker. 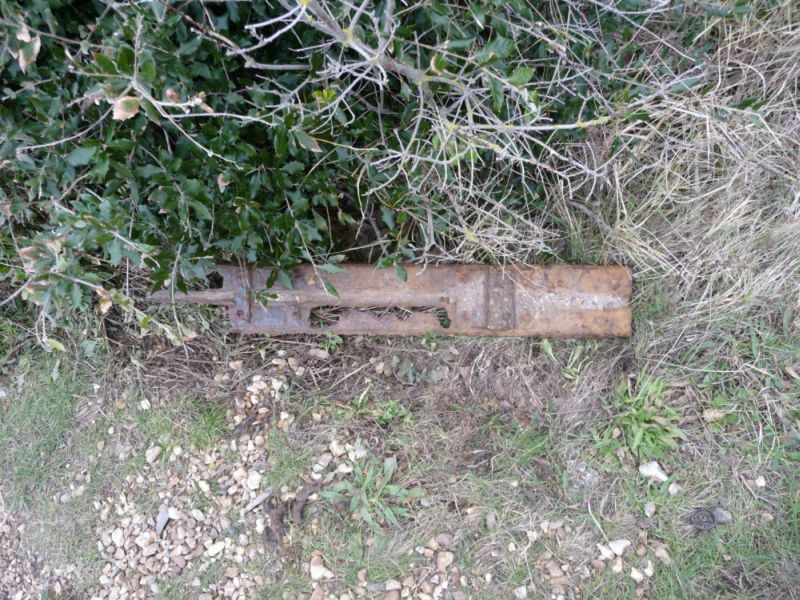 A metal sleeper for the Gilkicker railway that was uncovered from the path and discarded into nearby bushes in 2008 confirming that it is 60cm gauge. Although it has been suggested that the line was dismantled in 1939 several sections of rail could still be seen in the 1970s. 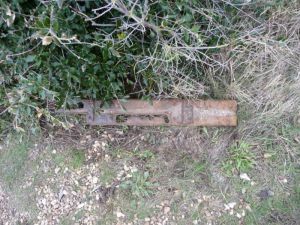 This piece of rail was seen adjacent to the footpath in April 2010. 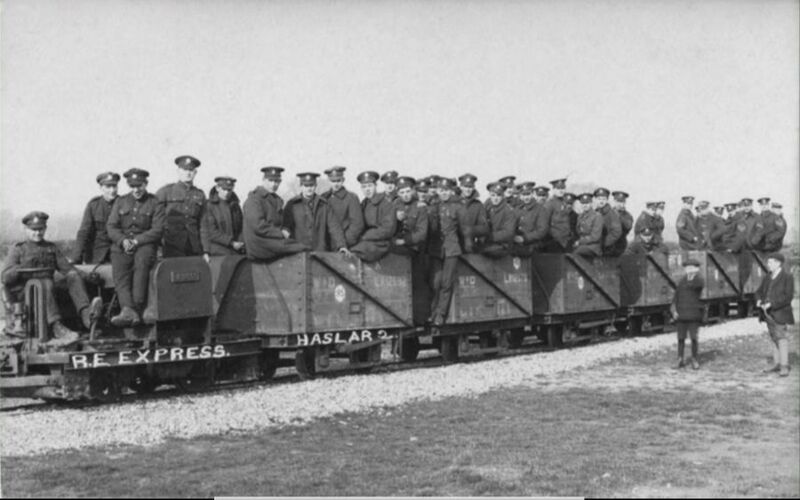 The Haslar to Blockhouse Military Railway. 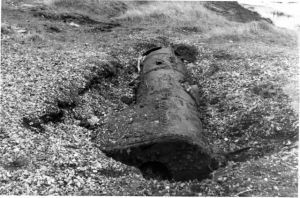 This line, also narrow gauge (18" gauge) and also constructed by the Royal Engineers, seems to have been built for use by the Submarine Miners and ran from the Submarine Mining Establishment at Stokes Bay to Fort Monckton, then on to Haslar Barracks, along the length of Haslar Sea Wall and finally into Fort Blockhouse. It is shown on an Admiralty plan (dated 1912?). By 1918 the section from the S.M.E. to Monckton had been removed. Plans indicate that by 1920 the section from Monckton to Halsar barracks had also been removed leaving an 18inch gauge line running from the sea wall adjacent to Halsar Barracks to Fort Blockhouse. 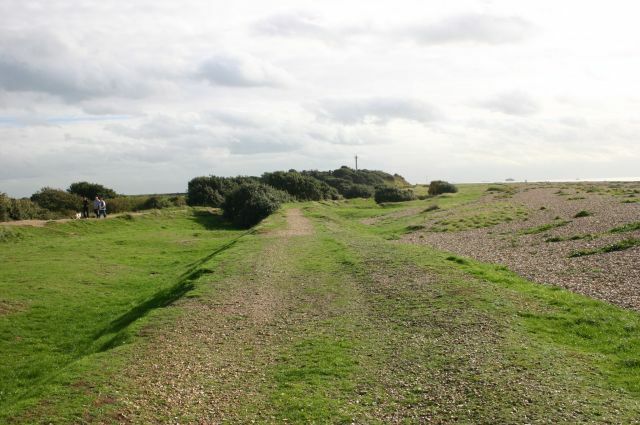 The 18inch gauge tramway was used initially (circa 1898) to move equipment and men between Stokes Bay Monckton and the Royal Engineers establishment in Blockhouse but by 1906 the Navy occupied Fort Blockhouse and presumably they took on responsibility for this part of the tramway. One plan suggests that it was linked for a short period to the internal tramways that served the nearby Haslar military hospital.